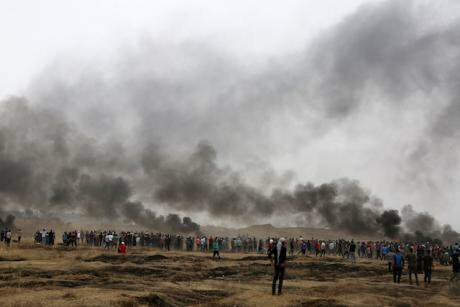 Palestinians demonstrating in Gaza were shot by Israeli snipers bringing the death toll since March 30 to over 90. Picture by Majdi Fathi/NurPhoto/Sipa USA/PA images. All rights reserved. On the sixth week of the ‘Great March of Return’ in Gaza, Palestinian protestors dressed as Na’vi from James Cameron’s box office hit Avatar in an attempt to draw wider recognition to their plight. This is not the first time Palestinians have turned to morphing into these fictional characters; in 2010 protesters adopted the same iconic characterisation in Bil’in when resisting the effects of the occupation wall. Palestinians then and now are right in recognising the parallels between the plight of the fictional Na’vi characters and their own experiences; both are victims of industrial militarism, predatory colonial capitalism and foreign occupation. Although Mark Fisher is also right to recognise the Na’vi as a primitivist cliché, consisting of an amalgamation of typical indigenous features, coupled with their experience of suffering the historically recurring tale of forced eviction and mass slaughter synonymous with colonial history, the parallel maintains relevance not just for those unfamiliar with the Palestinian story, but even more so for those who attempt understanding its current phase. This act of creative resistance attempts to exploit the power of universally understood images in a globalised world to stimulate interest and explicate suffering in what is considered a notoriously complex conflict. The tragedy of having to employ fictionalised representations of suffering to communicate actual, real-world oppression is a grave and serious one. That a metonymic portrayal of dispossession has more of a chance of undoing an international indifference than the dispossession itself seems to elucidate an incredible amount, not just about the Israel/Palestine conflict, but about our society and ourselves more generally. The multi-billion pound image of a blue-skinned alien possesses more potential for stimulating global interest and concern than the image of suffering brown-skinned Palestinians. Edward Said stressed ‘humanism is the only resistance we have’ but Gazans, having been blockaded by land, air and sea since 2007, with 50% of the population under the age of 18, have collectively felt the failure of the humanist ideal. For them the truth is simple: the multi-billion pound image of a blue-skinned alien possesses more potential for stimulating global interest and concern than the image of suffering brown-skinned Palestinians. For Palestinians to speculate that potential images of these fictional characters depicted in the media could inspire more supranational solidarity among the global public than the stories and images of their real human suffering shows a self-awareness of a tragic reality. Only an occupation so overdue solution could produce such a response. When civilians willingly risk death to walk peacefully along their restrictive boundary, the avenues for imaginative protest are clearly restricted. This is what ultimately leads to the willingness to dehumanise oneself in appeal to fans of a film. At the time the most expensive ever made, the 3D spectacle Avatar showcases the power of modern technology fueled by immense concentrations capital, in stark contrast to Gaza where clean water is scarce and electricity turned off for days at a time. It brings the Palestinian resistance into a post-human phase where material human value is lost in media transmission, perhaps it was never even there, but is retained (or created out of nothing like a simulacra) by packaging it into un-distortable symbol transcending human prejudice. It represents an attempt to reach out to the foreign public, as opposed to the intransigent global political class, who have been unwilling to demand Israeli forces to end the onslaught of demonstrators in the Gaza strip, having killed at least 56 since the start of the protests. Whilst Boris Johnson stated he was ‘appalled’ by the violence, it once again fell on the opposition, led by Jeremy Corbyn, to demand the government call for an independent international inquiry through the UN, and to review UK arms sales to Israel, which have increased ten-fold to $445 million since the onslaught in 2014, including the sale of sniper rifles. In spite of the troubling implications of the Palestinians resorting to their own dehumanisation in order to affect sympathy, they are right to acknowledge the potential liberation power of popular public support. However uniformly a media agenda is represented to its citizens, as long as we live under a parliamentary system the public still has the power to press for the importance of a topic. If the insistence is powerful enough, politicians are forced to confront and react to this insistence to achieve public support. We are our politics as much as we may not like to think it. Rather than force the oppressed into the humiliation of self-dehumanisation to appeal to our own disregard of human value, if we want to see peace we can re-humanise Palestinians by re-conceptualising all human suffering as our own. We can and we must.